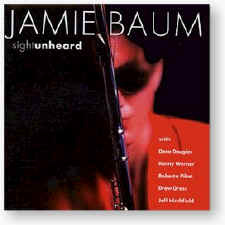 Jamie Baum’s second CD as a leader, with masterfully assembled personnel — Dave Douglas, Kenny Werner, Jeff Hirschfield, Roberta Piket and Drew Gress. Introduce these volcanic performers to such an activating agent as Baum’s music and an eruption is inevitable. The resulting sonic avalanche settles into a beautiful new jazz landscape. Baum has impressed musicians and critics alike with her inventive and imaginative compositions and atypical approach to the flute as a lead instrument. Having lived in New York for ten years, she has worked as a leader or sideperson with Randy Brecker, Paul Motian, John Abercrombie, Mick Goodrick, George Russell, Kenny Werner, Fred Hersch, Kenny Barron, Dave Douglas, Mike Formanek, Billy Hart and others in a wide range of styles from jazz to classical to new music. All compositions by Jamie Baum, except where indicated. (1, 6-9) Recorded at Steve Davis Studio, NYC, Jan. 1995 and (2-5) at Systems Two, Brooklyn, NY, Dec. 1995.